The Main Hall is the first step in expanding your home after building the basic Small House layout. It contains three separate areas: the Entryway, the general space of the Main Hall, and the Cellar. The following is a list of possible furniture items and decorations which can be added by using the carpenter's workbenches in the Main Hall. It is not necessary to purchase or build all furnishing options; you can pick and choose to better dictate style. However, all furnishing options are in a pre-arranged location and only ingredients and standard items can be moved. Oftentimes, the name of the furnishing option only indicates the primary piece of furniture, and actually includes various additional containers and accessories. Remodel House into Entryway No materials needed. Available after steps 1-6 are complete (with or without cellar). Removes some existing furnishings. Adds different furnishing options (see this page for details). A number of miscellaneous items are added with various furnishing options, but only notable items are specified on this table—specifically, usable containers. Though other common items and ingredients are added to your home, they are not listed here. Note that the icon displayed for each furnishing option does not necessarily represent what is actually built in your home. Note that the End Table option will no longer be available once you've built the Main Hall, and must be added to the entryway while still using the Small House layout. Barrels † Sawn Log, Nails, Iron Ingot One southwest corner with two sacks. One northeast corner with one sack. Dresser † Sawn Log, 3 Nails, Iron Fittings East wall, back. Display Case on Low Table 2 Sawn Log, 4 Nails, Hinge, Glass East wall, center. End Table with small Display Case and Strongbox. Display Case on Low Table 2 Sawn Log, 4 Nails, Hinge, Glass West wall, center. End Table with large Display Case. Low Table Sawn Log, 2 Nails West wall, south side. Night Tables (2) 2 Sawn Log, 4 Nails One on each side of north wall. Weapon Racks (2) 2 Sawn Log, 2 Iron Fittings One single rack on each side of end table on east wall. Weapon Racks (2) 2 Sawn Log, 2 Iron Fittings One single rack on each side of end table on west wall. Corner Shelf † Sawn Log, 3 Nails Southeast corner. Wall Shelves (2) Sawn Log, Nails One on each side of north wall. Wall Sconces (2) † Iron Fittings, Goat Horns One on each side of door. Mounted Bear Head Leather Strips, Bear Pelt Back west wall. Mounted Elk Head Deer Hide, Large Antlers, Leather Strips East wall middle, above End Table. Mounted Elk Head Deer Hide, Large Antlers, Leather Strips West wall middle, above End Table. Mounted Sabre Cat Head Leather Strips, Sabre Cat Pelt, 2 Sabre Cat Tooth East wall, north side. Mounted Snowy Sabre Cat Head Leather Strips, Sabre Cat Snow Pelt, 2 Sabre Cat Tooth West wall, south side. Mounted Wolf Head Leather Strips, Wolf Pelt East wall, front. Wall Sconces (2) Iron Fittings, Goat Horns Behind night stands. Wall Sconces (2) † Iron Fittings, Goat Horns Front wall, either side of door. †This option does not appear if you have previously created the item in the Small House Layout, as it is still in place. ‡The unofficial patches fix a bench which should have replaced the end table from the small house. This requires one additional sawn log and a nail. In addition, the mounted bear head becomes a mounted cave bear head, requiring the appropriate change in materials. The general space of the Main Hall is split up into three areas, distinguished by their own individual carpenter's workbenches. The first area is the large two-level room with the staircases. The carpenter's workbench in the southwest corner of the first level controls the furnishings for both levels of this room. There is a second carpenter's workbench on the north side of the first level (which contains the door in the floor which leads to the Cellar). A third carpenter's workbench can be found on the north side of the second level, which actually contains three of its own distinct sections, notable by the walls dividing them. Each of the three areas distinguished by their own individual carpenter's workbenches have been organized into three separate tables which include the count of total materials for furnishing options in that specific area. A number of miscellaneous items are added with various furnishing options, but only notable items are specified on this table. This includes usable containers, rare ingredients, any food or ingredients on hanging racks, items which can be used for crafting activities, or items which were newly added by Hearthfire. Though they are added to your home, other items and ingredients are not listed here. Because the large south room has two levels, the "level" column notes the level on which the furnishing option is placed. Note that the icon displayed for each furnishing option does not necessarily represent what is actually built in your home. Barrels Sawn Log, Nails, Iron Ingot 1 Southwest corner. Two barrels. Chest Sawn Log, Nails, Iron Fittings, 2 Hinge, Lock 1 West side, beneath staircase. Adds one sack. Chest Sawn Log, Nails, Iron Fittings, 2 Hinge, Lock 1 East side, beneath staircase. Adds one barrel. Tall Wardrobe Iron Fittings, 4 Nails, 2 Sawn Log, Hinge 2 Southwest corner, second level. Wardrobe, Small Iron Fittings, 2 Nails, Sawn Log 2 East wall, south side, second level. Adds one strong box. Chair Sawn Log, Nails 2 South wall, west side, second level. Adds small stand with one satchel and Argonian Bloodwine. Dining Table and Chairs 3 Sawn Log, 5 Nails 1 Center of room. Adds four chairs, two apple dumplings. Display Case 2 Nails, Sawn Log, Hinge, Glass 2 South wall, center, second level. Display Case on Low Table 2 Sawn Log, 4 Nails, Hinge, Glass 1 East wall, south side. Adds one satchel and one sack. Square Table Sawn Log, 2 Nails 1 West wall, beneath staircase. Adds one barrel. Square Table Sawn Log, 2 Nails 1 East wall, beneath staircase. Adds two sacks. Washbasin on Stand Sawn Log, Nails, Iron Ingot 1 South wall, east of door. Adds one barrel, one sack, hanging rack with rabbit and dried elves ear. Armor Mannequin Sawn Log, Nails, Quarried Stone 2 South wall, east of center, second level. Corner Shelf Sawn Log, 3 Nails 2 Northeast side, second level. Adds one satchel. Corner Shelf Sawn Log, 3 Nails 2 Northwest side, second level. Tall Shelf 2 Sawn Logs, 4 Nails 2 East wall, south side, second level. Adds one knapsack, one mammoth tusk. Wall Shelves (2) Sawn Log, Nails 1 One on east wall. Adds one sack. One on west wall. Adds one sack. Wall Shelves (4) 2 Sawn Log, 2 Nails 2 Two on south wall, center. One on west wall, south side. Adds one sack and a soul gem brazier. One on north wall. Adds honey. Alchemy Lab Sawn Log, 2 Nails, Glass, Quicksilver Ingot, Iron Ingot 1 Southeast corner. Adds two sacks. Arcane Enchanter Sawn Log, Nails, Glass, Refined Moonstone, Iron Ingot, Grand Soul Gem (filled with grand soul)†, Gold Ingot 2 West wall, south side, second level. Adds three sacks, one soul gem. Chandelier, Large 2 Iron Ingot, 2 Iron Fittings 2 Center. Fireplace Sawn Log, 4 Quarried Stone 1 North wall. Adds cooking pot, two sacks, one barrel, one jug of milk, and one hanging rack with dried elves ear and garlic braid. Mounted Goat Head Leather Strips, Goat Hide 2 South wall, west side, second level. Mounted Horker Head Leather Strips, 2 Horker Tusk 2 South wall, east side, second level. Mounted Mudcrab Leather Strips, 2 Mudcrab Chitin 1 East wall, south side. Mounted Slaughterfish Leather Strips, 4 Slaughterfish Scales 1 West wall, south side. †The workbench recipe for the Arcane Enchanter lists a Grand Soul Gem as being required, which confusingly makes it look like you need an empty one, not a filled one. The furnishing options for the downstairs level of the north room in the main hall are listed here. Note that the icon displayed for each furnishing option does not necessarily represent what is actually built in your home. Barrels Sawn Log, Nails, Iron Ingot Northwest corner. Adds five sacks, two barrels. Cupboard 2 Sawn Log, 4 Nails, Iron Fittings East wall, north side. Adds one barrel and one knapsack. Desk Iron Fittings, 2 Nails, Sawn Log South wall, center. This furnishing option is not usable for storage. Display Case and Small Wardrobe Iron Fittings, 4 Nails, 2 Sawn Log, Hinge, Glass North wall, east side. Safe Lock, Hinge, 3 Steel Ingot South wall, west of center. Adds two sacks. Wardrobe, Small Iron Fittings, 2 Nails, Sawn Log East wall, south side. Adds sack and Lamp Stand. Round Table and Chairs 2 Sawn Log, 4 Nails Center of room. Two chairs. Square Table and Chairs 2 Sawn Log, 4 Nails West wall, center. Two chairs. Weapon Plaque Sawn Log, Iron Fittings South wall, center. Includes left and right weapon slots with a central shield slot. Tall Shelf 2 Sawn Log, 4 Nails West wall, south side. Blacksmith Anvil 4 Iron Ingot, Sawn Log South wall, east side. Mounted Elk Antlers Large Antlers, Leather Strips West wall, north side. Mounted Slaughterfish Leather Strips, 4 Slaughterfish Scales North wall, east side. The north area of the upstairs level is effectively divided into three rooms. The east side is the main bedroom; the west side is the children's bedroom. The north side is a small walkway between them, and contains the door to the North Wing if you have constructed that addition. Because this part of the main hall has three distinct sections, the "Room" column notes the room in which the furnishing option is placed: E for east, N for north, and W for west. Note that the icon displayed for each furnishing option does not necessarily represent what is actually built in your home. Cupboard 2 Sawn Log, 4 Nails, Iron Fittings W West wall, south side. Display Case and Small Wardrobe Iron Fittings, 4 Nails, 2 Sawn Log, Hinge, Glass E West wall, north side. Dresser Sawn Log, 3 Nails, Iron Fittings W East wall, center. End Tables (2) 2 Sawn Log, 4 Nails E One on south wall. One on west wall, south side. Adds one sack. Tall Wardrobe Iron Fittings, 4 Nails, 2 Sawn Log, Hinge E South wall, west side. Tall Wardrobe Iron Fittings, 4 Nails, 2 Sawn Log, Hinge E North wall, west side. Chest, Long † Sawn Log, Nails, Iron Fittings, 2 Hinge, Lock E East side, foot of Double Bed. † This option only appears after crafting the Double Bed. Chair Sawn Log, Nails E South of north doorway. Display Case on Low Table 2 Sawn Log, 4 Nails, Hinge, Glass E East wall, north of center. End Table with Display Case. Double Bed2 2 Sawn Log, 2 Nails, 4 Leather Strips, 2 Straw E West wall. †Adds a long chest to the Containers category. Single Bed Sawn Log, Nails, 2 Leather Strips, Straw W East wall, north side. Adds night stand. May be used as child's bed. Single Bed Sawn Log, Nails, 2 Leather Strips, Straw W East wall, south side. Adds night stand. May be used as child's bed. Weapon Plaque Sawn Log, Iron Fittings E East wall, south of center. Display Case and Shelf 2 Sawn Log, 4 Nails, Hinge, Glass W West wall, south of center. Tall Bookshelf 2 Sawn Log, 4 Nails E North wall, east side. Adds one barrel and one knapsack. Tall Shelf 2 Sawn Log, 4 Nails N South wall. Adds one strong box and one barrel. Wall Shelves (3)2 Sawn Log, Nails W One southeast above Single Bed. One northeast, above Single Bed. One on west wall, north side. Wall Shelves (4) 2 Sawn Log, 2 Nails E One on west wall, south side. Adds strong box. One on east wall, south side. There is not a fourth shelf. Chandelier, Small Iron Ingot, 3 Goat Horns, Iron Fittings W Center. Chandelier, Small Iron Ingot, 3 Goat Horns, Iron Fittings E Center. Mounted Snowy Sabre Cat Head Leather Strips, Sabre Cat Snow Pelt, 2 Sabre Cat Tooth E West wall, center (directly above Double Bed if you have built it). Mounted Wolf Head Leather Strips, Wolf Pelt W East wall, center. Mounted Wolf Head3 Leather Strips, Wolf Pelt W West wall, south side. 1This option may appear with a chest on the bottom shelf instead of a display case. 2If you built this item in the Small House Layout, it will appear here if you remodel the house into an entryway. 3The unofficial patches change one of the mounted wolf heads to a mounted ice wolf head, requiring the appropriate change in materials. "Cellar" redirects here. For other uses, see Cellar (disambiguation). The Cellar is accessible via a small trapdoor in the floor of the small north room on the first level of the Main Hall. The cellar itself is effectively divided into two rooms, one on the north and one on the south. The north room contains the ladder which exits to the Main Hall. A number of miscellaneous items are added with various furnishing options, but only notable items are specified on this table. Common items and ingredients are not listed here. Note that the icon displayed for each furnishing option does not necessarily represent what is actually built in your home. The "Room" column in the table notes the room in which the furnishing option is placed: N for north, and S for south. Barrels Sawn Log, Nails, Iron Ingot S One on east wall, north side. Two on east wall, south side. Adds one knapsack. Barrels Sawn Log, Nails, Iron Ingot S One on south wall, west side. Barrels Sawn Log, Nails, Iron Ingot S Three barrels and one sack, on the middle shelf of the west set of shelves. Barrels Sawn Log, Nails, Iron Ingot N One barrel and one sack in northwest corner. Includes one sack of flour. One barrel and one sack in northeast corner. Chest Sawn Log, Nails, Iron Fittings, 2 Hinge, Lock S South shelves, top shelf. Long, narrow version. Chest Sawn Log, Nails, Iron Fittings, 2 Hinge, Lock S West wall, north side. Chest Sawn Log, Nails, Iron Fittings, 2 Hinge, Lock S North wall, east side. End Table Sawn Log, 2 Nails S South shelves. End Table on bottom shelf, five sacks on middle shelf, one barrel on west side, and one sack on east side. End Table Sawn Log, 2 Nails N West wall, north side. Safe (5) 5 Lock, 5 Hinge, 15 Steel Ingot S East shelves, side-by-side on middle shelf. Adds deer pelt and snow bear pelt on top shelf. Safe (5) 5 Lock, 5 Hinge, 15 Steel Ingot S West shelves, side-by-side on bottom shelf. Display Case on Low Table 2 Sawn Log, 4 Nails, Hinge, Glass N South wall, west side. End Table, adds one knapsack and one sack. Low Table Sawn Log, 2 Nails N Between east wooden support beam and doorway. Square Table and Chairs 2 Sawn Log, 4 Nails N North wall, west side. Adds apple dumpling. Washbasin on Stand Sawn Log, Nails, Iron Ingot N North wall, east side. Coffin* 2 Nails, Sawn Log, Hinge, Vampire Dust N East wall, center. It can be used to sleep. * This furnishing option only appears for vampire players. Armor Mannequin Sawn Log, Nails, Quarried Stone N East side of the west wooden support beam. Weapon Plaque Sawn Log, Iron Fittings S South wall, east side. Includes left and right weapon slots with a central shield slot. Weapon Plaque Sawn Log, Iron Fittings N East wall, north side. Includes left and right weapon slots with a central shield slot. Weapon Racks (5) 4 Sawn Log, 5 Iron Fittings N North wall, center. Corner Shelf Sawn Log, 3 Nails N East wall, north of center. Corner Shelf Sawn Log, 3 Nails N East wall, south of center. Wall Shelves (2) Sawn Log, Nails N One on north wall, center. Adds two sacks. One on north wall, west side. Wall Shelves (2) Sawn Log, Nails N One on east wall, center. Holds three human skulls. Wall Shelves (3) Sawn Log, Nails S One on east wall, north side. One on east wall, south side. Adds lantern which heavily lights the room. One on north side of west wall. Adds one knapsack, one ice wolf pelt. Archery Target Leather Strips, Sawn Log, 2 Straw S Southeast corner. Armorer Workbench Sawn Log, Iron Ingot, 2 Quarried Stone S North wall, west side. Blacksmith's Forge Iron Fittings, Iron Ingot, 2 Sawn Log, 5 Quarried Stone S Center of room. Child's Practice Dummy Leather Strips, Sawn Log, 2 Straw N North side of east wooden support beam. Grindstone Sawn Log, Iron Fittings, Quarried Stone S North wall, east side. Mead Barrels (2) Sawn Log, Nails, Iron Ingot, 2 Quarried Stone N South wall, east side. Each one yields 5 Nord Mead when activated. Mounted Bear Head Leather Strips, Bear Pelt N West wall, north side. Mounted Bear Head† Leather Strips, Bear Pelt S North wall, east side. Mounted Elk Antlers Large Antlers, Leather Strips S North wall, west side. Mounted Elk Head Deer Hide, Small Antlers, Leather Strips N West wall, south side. Mounted Snowy Sabre Cat Head Leather Strips, Sabre Cat Snow Pelt, 2 Sabre Cat Tooth N North wall, east side. Shrine Base 2 Clay, 2 Quarried Stone, Sawn Log N West wall, center. See Shrines for crafting information related to each shrine. Smelter 2 Iron Fittings, 5 Iron Ingot, 6 Clay, 4 Quarried Stone S Southwest corner. Tanning Rack Sawn Log, Leather Strips S East wall, north side. Wall Sconce Iron Fittings, Goat Horns S South of west shelves. Wall Sconces (2) Iron Fittings, Goat Horns N North side of wooden support beams. Wall Sconces (2) Iron Fittings, Goat Horns S Either side of doorway. Wall Sconces (2) Iron Fittings, Goat Horns N Either side of doorway. Wall Sconces (2) Iron Fittings, Goat Horns N North wall, on center wall supports. *Coffin and shrines are not included in the totals. †The unofficial patches change one of the mounted bear heads to a mounted cave bear head, requiring the appropriate change in materials. After crafting the shrine base, you will now have the option to craft shrines from the miscellaneous section of the carpenter's workbench menu. Each shrine requires a particular Amulet of the Divines. See Shrines for a description of the blessings provided by each shrine. After building the Cellar addition, you may experience a random skeever infestation in that part of your home. This is the only type of enemy spawn which occurs indoors, as all other random enemies spawn outside (see Lakeview Manor page for a related bug). When this happens, other residents of your home may comment on the noise coming from downstairs. When you have killed all but one of the skeevers, the last skeever will not attack and simply run from you until you either kill it or sheathe your weapons. If you sheathe your weapons, it will become non-hostile. Quests that flag a common item as a quest item can prevent you from building furniture that requires that item. This can include named items, such as those created by The Fishing Job and similar quests. 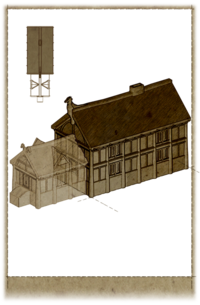 When building the Cellar, crafting the Shrine Base and some of the individual deity shrines before other furnishings can result in the workbench subsequently only listing the remaining non-built shrines. ? This can be circumvented by activating (praying at) one of the shrines and then reloading the workbench interface immediately afterward. In most cases, crafting all the possible shrines will restore the normal functions of the workbench. The safes in the cellar can remove the stolen tag from items. ? The Skeever infestation can activate on houses that do not yet have a basement. ? This page was last modified on 24 February 2019, at 20:41.